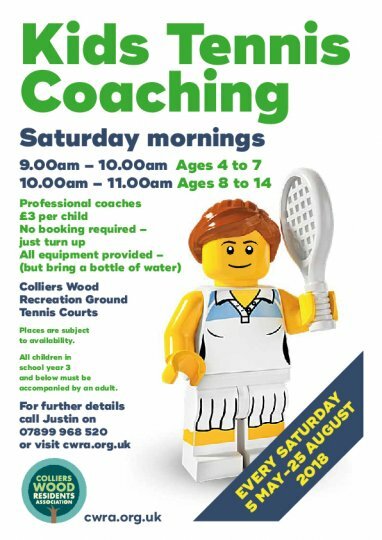 Kids tennis coaching will be starting again on Saturday 5th May 2018 and will run till the end of August. The sessions are organised by local residents for the benefit of the community, and the coaching is led by professional coaches Liz and Tom from Merton School Sports Partnership. Sessions are £3 each per child, which covers the cost of the coaches, and there’s no need to book – just turn up. All equipment is provided – all you’ll need to bring is a water bottle. Note that children in school year 3 and below must be accompanied by an adult at all times. For the younger children in particular, there are lots of fun games to teach them basic tennis skills. No experience is necessary, just enthusiasm.